ears after graduation, one thing many students still remember about the University District is Chittenden Ave. Not because of anything there. There really isn’t anything remarkable or unusual about the street. It’s the name. “Chittenden, what does that mean?” they ask. It sounds suspiciously like something else. Chittenden Ave. is really the namesake of one of Columbus’ leading citizens of the 19th Century. That man was millionaire real estate developer, rail pioneer, hotelier, showman, history buff, and songwriter Henry Treat Chittenden (1834-1909). Henry was born in 1834 when Columbus was still a small town of just over 5,000 souls that didn’t even reach to the limits of the present day downtown. Henry grew up with three brothers and three sisters at his family’s home near Broad and Third Street (approximately where the Columbus Dispatch Building now stands). Henry’s father, Asahel (1797-1880), was wealthy and well connected. He owned and sold land. He ran a paper mill and several other businesses. He invested in the first railroad link to Columbus. The family was active in politics and he served for many years as a Franklin County Commissioner. The proceeds of Asahel’s investments allowed him and his family to live well. Asahel sent all of his sons to Yale. His children all married into prominent local and Ohio families. Henry graduated from Yale in 1855 and obtained a law degree in 1858. He practiced in Texas, Galena, Illinois (where he befriended a leatherworker named Ulysses S. Grant), and Dayton, Ohio for a few years before returning home in 1861 to look after the family’s business interests. In 1872, he married Catherine Helen Mithoff (1851-89), daughter of his business partner. They had three children. In the Civil War, Chittenden was a captain in the famous “Squirrel Hunters” Brigade that defended Cincinnati from Confederate raiders. In early September 1862, Confederate forces took Lexington, Kentucky and sought to drive north across the Ohio River. Ohio Governor David Tod called for forces to muster to defend the homeland. In response, nearly 20,000 irregulars from south and central Ohio marched into the Queen City. Alongside Union soldiers, the irregulars built and manned a formidable line of defenses in the hills of Covington. Daunted by the opposition before them, the Confederates abandoned their effort to overrun the city. After the war, Henry Chittenden made his first big money in streetcars. A streetcar company had been established in Columbus with a license to serve the High Street route but the company struggled. Service was irregular. The ride was uncomfortable, dirty, and sometimes dangerous. Infrastructure was poorly maintained. Most of the city remained unserved and the company battled to make a profit. In 1873, Henry and his business partner/father-in-law E.T. Mithoff bought control of the company for around $25,000 and set to turning it around. The investors spent to improve infrastructure and labored to make service safe, comfortable, and dependable. They gobbled up competing lines and soon spread service throughout the city. By the 1890s, the Columbus Consolidated Street Railway Company was an integral part of city life and very profitable. When Chittenden and Mithoff cashed out in 1892, the company’s stock was worth more than $3 million. In those days, horses pulled the cars so there was a need for someplace to feed and house them as well as park the cars at night. It is through this need that Chittenden's name becomes connected to the University District. Chittenden and Mithoff purchased some land near the intersection of what is now Chittenden and High. The area was rural at the time, dotted with a few isolated farmhouses and the very beginnings of Ohio State University. The land was cheap, close to suppliers of hay and oats, and had the advantage of resting near the northern terminus of the company’s main route. Chittenden and Mithoff built their horse barns and streetcar garages on the northeastern corner of the intersection. The Peerless Building that houses Singing Dog Records sits almost exactly where the old car garage used to be. 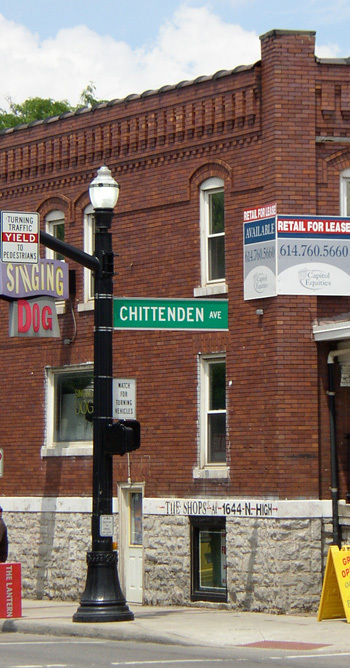 The street running east from High St. past the barns was named Chittenden. A smaller street running north-south to the east of the barns was named Mithoff Alley (today’s Pearl Alley). In 1888, Chittenden Ave. was witness to a first. That summer, the city’s first electric-powered streetcar carried passengers from High Street east on Chittenden to the gates of the Ohio State Fairgrounds. There’s a reason Henry set up this experimental line when and where he did. 1888 was going to be a big year for the Ohio State Fair and a big year for Henry Chittenden.